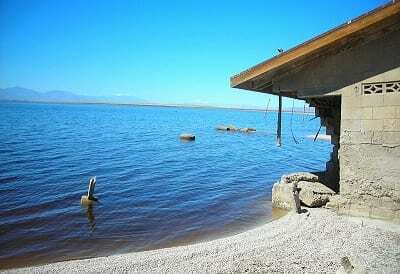 Hopes could be raised for Salton Sea green energy advocates and those who support the lake’s restoration. Controlled Thermal Resources (CTR), a multi-faceted Electricity Generation and Mineral Extraction Corporation, is interested in developing a huge geothermal energy plant by the Salton Sea; the shallow, saline, endorheic rift lake that sits on the San Andreas Fault and is mostly located in California’s Coachella and Imperial Valleys. The lake is home to one of world’s strongest geothermal reservoirs and the development of more renewable resources in the area is welcome by many advocates of clean energy and those who wish to see the site restored. A lease agreement has been approved for the project. The Imperial Irrigation District’s board of directors voted in favor of the new plant and approved a 1,900-acre lease agreement with Controlled Thermal Resources. CTR has proposed a geothermal energy facility of 250 megawatts (MW) along the southern shore of the lake, near Calipatria. The plant is expected to generate five times more power than any of the other 11 existing plants in the region. However, the California Energy Commission needs to approve the proposal before the plant can be built. Furthermore, another setback that CTR faces is high up-front costs. This is the same issue that pops up for the majority of geothermal developments in the area, which is one of the reasons why so few plants have been built. Since 2000, only one plant has been constructed in the area. CTR believes it will succeed with its Salton Sea geothermal energy plans where others have failed. Researchers at the National Renewable Energy Laboratory believe that there is minimal hope of new geothermal power plants producing billions of dollars for the restoration of the Salton Sea. However, Rod Colwell, the chief executive of CTR, believes that his company will be successful where others have failed. Colwell says that Controlled Thermal Resources can lowers costs via economies of scale. Building a plant at 250 MW can offer electricity at a cost that will appeal to utilities and other potential buyers. Clowell also said that his company has already made plans to expand the 250 MW project to 375 MW in the future. However, for the time being, CTR intends to start exploring the site and drilling test wells. Colwell expects the approval process to take 18 months and his hope is to finish construction on the geothermal energy plant by 2020. The facility would be CTR’s first project. is this a flash system plant, or a closed circuit binary system. Is the $800 to $900 million cost for the plant construction and wells only? What would a 20 year PPA price be like? including O&M and transmission costs.